I'm thrilled to say Jacqueline played along! You can see her lovely card HERE. Beautiful huh? I love her fresh, spring-y take on it. I'm extra thrilled because she used one of the flower garland stamps I designed for justjohanna in her card. Well, here is my entry. I guess I was feeling very literal. I tried to include some of the gold tone accents with my eyelets and the larger grommet. I colored the off white Bazzill base using a color duster brush and Vintage Photo distress ink. If you brush lightly over textures Bazzill paper - the ink really brings out the texture. I rounded the bottom to try to mimic the purse. 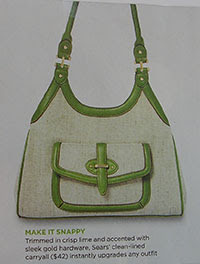 I chose a leaf because the purse looked kind of "crunchy granola natural" to me. A nature stamp seemed right. 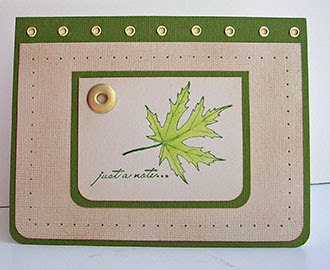 The stamp set is "Au Naturale" from Lizzie Anne Designs. I paper pierced the holes - well - because it looked like it "needed" something, why not holes??? So.... Here is next week's inspiration piece. At least it has some colors! (a lot of colors...). I'd be thrilled to have you play along. Just leave a comment with a link to your creation and I'll include it in the post next Tuesday. A little news on the Paper Garden Projects store. First - thanks so much for your response to the free shipping sale. I know the store has been a little "bare" peppered with"sold out's" since, but I have a TON of new products I'll be loading this week and I'm so excited about them. I did want to mention that I'm still stalking 3 different suppliers to get the Treading Water border punch back in stock. But - I did manage to get my hands on some of the "Lacy Days of Summer" border punch. This one is quite lovely to and I can't wait to play with it. Also the Mega Thanks set is back in stock! Yay! I also have some new kits coming out - with stamps. Great stamps! OK... gotta go get to work loading stuff! Wow, you are a very clever lady - your take on the sketch is very special - a beauty!! I really love this idea and I didn't know that you were the one that designed that garland stamp!! 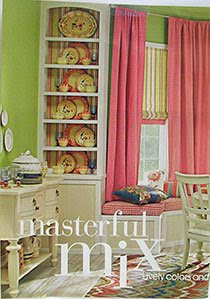 i love how you get your inspiration from magizines and other pictures. very smart! Glad you got the MEGAthanks set back in- that's a GREAT stamp set. Now I am just waiting for the Threading Water and the ticket corner punch! BTW- I *did* notice your card(no, I do not just shop here, lol) and it is LOVELY!!! love both of the takes on your challenge. I ran out of time to play along this week...but I'm aiming to give next week's a try! I hav something for you, check out my blog. You can play along if you like. Wow! Great take on the inspiration picture. You sure did nail this one for sure! It's perfect! I love the colors for your next challenge, I think I'm gonna have to play along. Good to hear that your new venture is going well!